I try to pick up on the things that Braeden likes, so he can further explore them. He loved the horses in his books, so I took him to see horses. Maybe he'll be a rancher someday. He loved whacking sticks on various objects to hear the different sounds they make, so I made sure he had a couple types of drums around. Maybe he'll be a drummer someday. See what I mean? The little things that a child expresses interest in may be their future career, so I try to let them all blossom. Then they can choose later in life. When we were in Arkansas last winter, Grammy and Grampy Wais sent Brady P. some cooler pajamas to wear on those hot nights. One pair had four different kinds of sports balls all over them. Each time he wore the pants, he would point to a soccer ball. 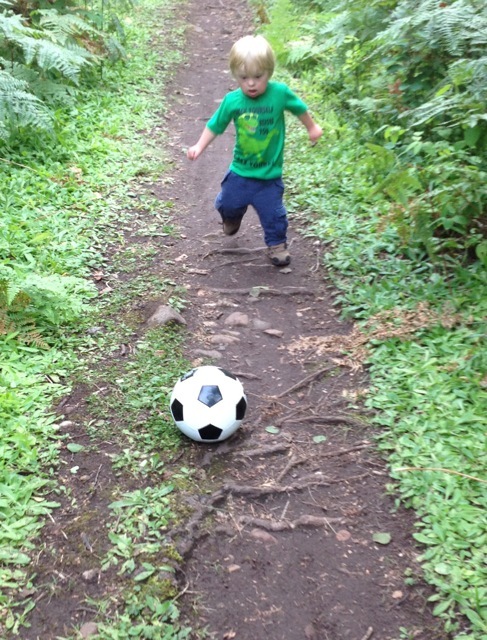 "Soccer ball," I told him. He looked down his leg to find another one. And another one. And another one. "Soccer ball. Soccer ball. Soccer ball," I repeated for each pointing. I don't know if he liked the pattern of the soccer ball or what, but he never pointed to the baseball, football or basketball. Ever. And the soccer ball was incessant. "Okay, Brady P. I get it. We'll get you a soccer ball," I told him. So I bought my tiny son a soccer ball with the classic black and white pattern like the one on his pj pants. Supposedly, my two-and-a-quarter year old son, who just learned to walk steadily a couple months prior, was going to learn how to kick a soccer ball. When I put it in the cart, he gave me the owl face. This face, where his eyes get big and his mouth turns into a little "o," means that he is the most excited he can be. "Yes," I thought. "He likes the soccer ball!" Then we had to learn how to kick it. Brady P. had been chucking rocks and tossing balls for months before that, but never did we think about giving it a good kick. Well, in soccer you're not supposed to use your hands, so it was time to learn how to kick. I thought it would be a fun thing to do on a fresh Arkansas spring day. But instead of having a kicking spree, I observed the workings of the neurological pathways of my child's brain. Yes, it was a lesson in brain science right there in the driveway. I told Brady P. to kick it. To use his foot. He knew what his foot was, but I watched as my words entered his ears. I heard his wheels turning as he looked at his foot and the ball. And I heard them spin as he tried to figure out how to move his foot toward the ball to make it move forward like I had demonstrated for him. Wow. That was a lot of processing for a little guy! He didn't get it the first day. Or the second. Or the third. But, for some reason, Brady P. was obsessed with the soccer ball. When he saw it on the porch, he would point and shout, "Eh!" So we tried and tried. About a week later, he had it. He could kick it, run after it and kick it again. He could kick it with the right timing after I kicked it to him. He was getting it! Little Brady P., who pointed to a cartoon on his jammy pants, was kicking a soccer ball down the driveway. Once we got back to the Copper Country, and the weather warmed up a bit, we got the soccer ball out again. He still loves that thing and enjoys working on his kicking skills. Look at him. He even has the serious soccer face! 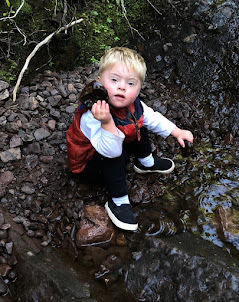 One evening, on our walk to throw rocks, we spotted a young man volleying a soccer ball to himself. This guy was amazing. He kicked it up, over his head, behind and side to side without letting it hit the ground. Braeden plopped down in the middle of the road and watched him in awe. Eventually the guy's ball hit the ground and rolled toward Brady P. Brady P. stood up, ran after it and grabbed it in his arms. "Can you kick it to the man?" I asked him. He threw it to the man instead. Perhaps he was massively humbled. "He really liked watching you," I told the young man. The man kicked it back to Braeden, and Braeden kicked it back to him. After chatting a bit more, I noticed he had an accent. Woah, what if that guy was a professional soccer player from a different country? When Braeden got up to leave, he waved good-bye to the man. "I think you made his day!" I told the man as we walked away. "Thank you!" "You're welcome!" he said as he waved to Braeden. We should have gotten his autograph.